The following web pages were reproduced from a small 8-page A5-sized booklet that was issued by Sydney Observatory and written by the then N.S.W. Government Astronomer, Dr. Harley Wood. 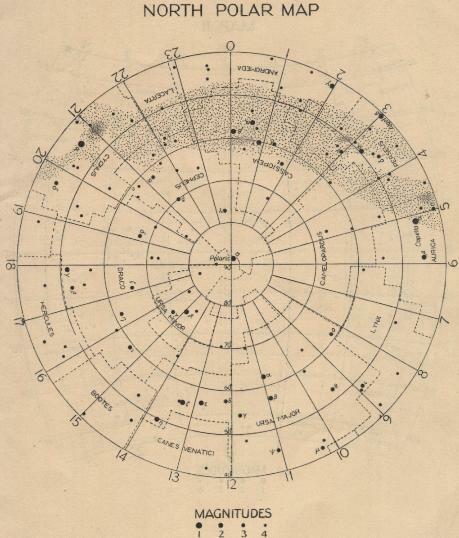 It is adaption of “Elementary Astronomy for Service Use” produced in the early 1940b. Andrew James : 30th April 2005. 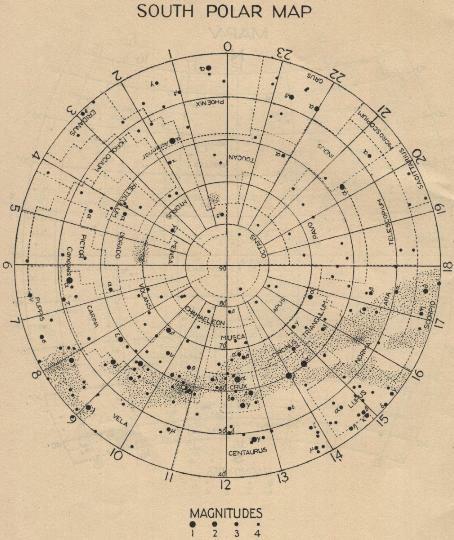 The star charts show the whole sky on six sheets, the first and last showing sections around the north and south poles. 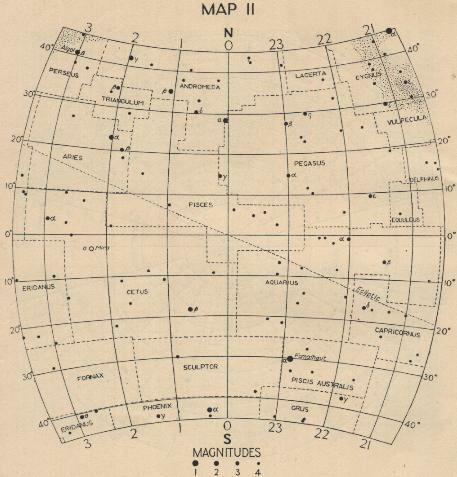 The positions of the stars in the sky are specified by two numbers which appear around the borders of the charts. The figures from 0 to 24, in hours and called right ascension, show which group of stars is high in the sky at the time of observation and the figures which read from 0° to 90° from the equator to the pole are called declination. These correspond to longitude and latitude on the surface of the Earth. For example the star Fomalhaut on Map II has a right ascension 22h. 50m. and declination south 30°. The following table shows the right ascension on the meridian at various hours during the night at different times of the year and will indicate which map to use. For example on February 5th at 10 p.m. the right ascension on the meridian is 7h. Since this right ascension is on Map III, this is the map to use. RIGHT ASCENSION ON THE MERIDIAN. Date. 6 p.m. 8 p.m. 10 p.m. 0 a.m. 2 a.m. 4 a.m. 6 a.m. 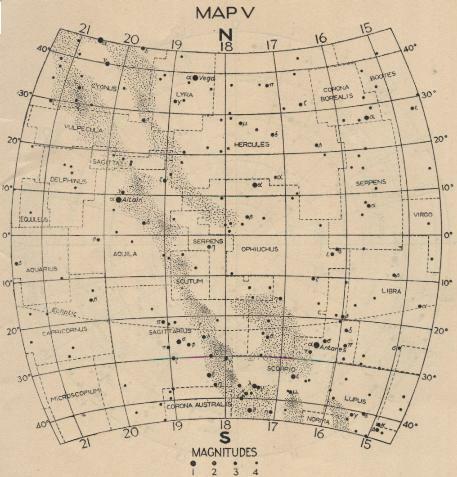 In order to compare the maps with the sky, hold them up so that the stars on the map will have the same orientation as the part of the sky being examined. The end of the maps marked N will always be to the north, and the higher right ascension towards the east. From New South Wales or places of a similar latitude when you are looking at the sky towards the north you will find it necessary to turn the top of the maps downward. When looking towards the east the top left-hand corner of the maps should be held downward, and when looking to the west the top right-hand corner should be held downward. 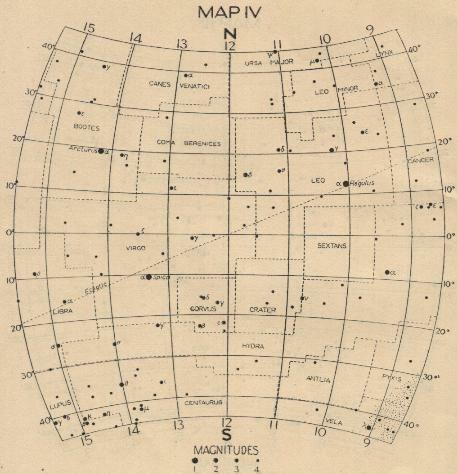 It is necessary to use neighbouring maps to cover the whole of the sky visible at one time. At the time quoted above if we look eastward we will go out [*2] of the area represented on Map III and enter the right-hand side of Map IV. The right ascension on the meridian in the table shows also that part of the polar map which is uppermost. The constellations (or groups or stars) in the northern part of the sky are mostly named from characters in Greek myths, such as Orion and Perseus. The southern part of the sky, which could not be seen by the Greeks, was divided up by astronomers and the sections given names chosen by them, for example Telescopium (the telescope). The names of some of the more important stars have been derived from Greek or Arab legend, others are named by a Greek letter and the name of the constellation in which they are situated. Usually, though not always, the letters are allotted nearly in order of brightness of the stars in the constellation, for instance α will be brighter than β, and so on. So that you will be able to use the names, a list of the Greek letters is given below. 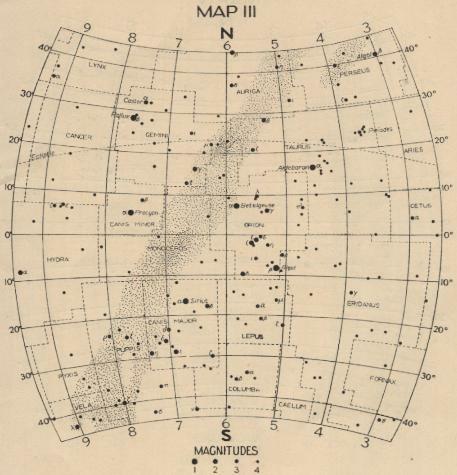 The relative brightness of stars in the sky is designated by numbers 1, 2, 3, etc., called magnitudes. The brightest stars have magnitude 1, and the fainter the star the larger the magnitude number. For example, Arcturus, Regulus and Spica on Map No. IV are 1st magnitude stars, while that star marked η to the right of Arcturus is a 3rd magnitude star. Stars down to a little fainter than the sixth magnitude can be seen with the naked eye. There are about 6,000 of these over the whole sky, only half of which can be seen at any one time. The maps are complete to magnitude 4.5. The shaded area represents the approximate extent of the Milky Way. Maps II to V show the ecliptic which is the path of the Sun and near which the Moon and the planets will always be found. The best way to begin learning the stars is to work outward on the sky and the maps at the same time from a part of the sky you already know or have managed to identify from the maps. The best constellations to start with are Crux (the Southern Cross), Orion or Scorpio. Suppose that Crux on the South Polar Map is already known and we wish to work from this. In the line from δ in Crux to β in Crux and about twice this distance further we see a bright star marked on the map — in Centaurus and a little further another marked α. The same configuration can easily be found in the sky. By thus connecting the stars in the sky and on the map with imaginary geometrical figures it is easy to extend the known region and after a few nights spent with the maps most of the constellations and brighter stars visible at the time should be easily recognizable.